Over the last 20 years, technology has opened the door to a far more flexible and personalized approach to learning. Millions of people have taken advantage of MOOCs, microcredentials and distance learning, not to mention countless informal modes of instruction ranging from podcasts to ebooks. This has all been a welcome development for the growing number of students who find that online, personalized instruction works better for them than does the traditional classroom. Today, roughly 5 million K–12 students take at least one course online, and more than 300,000 students attend a public online school full-time. This has been a revolutionary development for a public education system that remained essentially unchanged for 200 years. As we are only beginning to discover the true potential of online learning, providers like us have a responsibility to ensure that it continues to evolve to best meet the needs of every student who chooses it. Students choose online schools for a multitude of reasons. Some have very few options where they live; others find it hard to succeed in a traditional classroom. Some have social challenges or medical needs, and still others have special circumstances such as a parent in the military or another job that comes with regular moves. Some are academically gifted, and others arrive behind in their education. Every student is unique. Our job is to find what works for each student and personalize his or her experience to maximize growth — academic and otherwise — to enable them to reach their greatest potential. We've come a long way toward this goal, but we know more work needs to be done to perfect the model of online and blended learning. We believe this means focusing on recruiting, training and retaining teachers who can create a culture of inspired learning. It means implementing programs to increase student engagement through data-driven instruction, face-to-face support and other personalized approaches. And it requires the ability to identify students who need more individual attention and ensure they get it. We have developed new strategies and programs that focus on all these imperatives, and the effort is paying off in student success. For example, following implementation of a curriculum aligned to state standards, teacher training and student engagement programs, two K12-partner schools in Indiana advanced by two letter grades for the 2017–2018 school year. A laser focus on using student data to drive personal instruction also helped raise English and Math test scores at Arizona Virtual Academy by an average of 65 percent and 75 percent, respectively, over two years. Louisiana Virtual Charter Academy (LAVCA) ranked 22 out of 321 high schools in the state that received ACT scores. But no school system can do it all on its own. Schools must also have support from policymakers and advice from experts in blended and online education. More precisely, we must all work together to advance sensible policies that support students wherever they attend school. These include better onboarding for new families, student engagement policies and improved accountability measures that factor in the unique characteristics like mobility and persistence. It also includes fair and equitable funding for all public schools. Learning in a fully online school is not for every student, but it is a false choice to think in terms of an all-or-nothing approach. 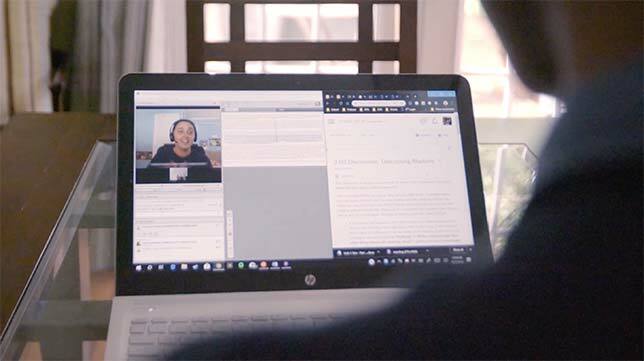 Online schools increasingly offer blended learning options, and we have begun to open centers where students can work with their teachers in person. It is all part of the continuing evolution of education. As demand for blended and online learning options grows and as we learn and innovate, we must all remain committed to continuous improvement — measuring, assessing and reforming so that every student can reach his or her full potential. This is our mission, and it should serve as a pledge for all educators and institutions to the students and families they serve. Nathaniel (Nate) A. Davis is the Chief Executive Officer and Chairman of the Board of Directors of K12 Inc., which partners with school districts in over 30 states to manage online schools.